“Hurricane Downs Trees” was last month’s big headline; and “Lava Cuts Highway” may well be next month’s big headline. But right now, the big news in Hilo is that it’s hot. This time of year is often the warmest, and on occasion the thermometer can hit 90, though that won’t break any records. But for the last few weeks, daytime Hilo temps have been consistently above 85. Some nights, a few clouds may pile up around Mauna Kea, dropping a sprinkle or two on some mauka communities. But in Hilo itself there’s been virtually no rain to break this heat-wave for a month or so. But with all this heat, and in the absence of precipitation that could stunt or rot cactus fruit in Hilo, our local eastside cacti are enjoying the rare dry spell that allows them to set fruit and keep it growing until their green skin turns red at maturity. Two kinds of dragon fruit are on the market, the difference being the color – red or white – of the flesh inside. On the outside they look the same, but the vendors know their sources, and will tell you which is which. In general, the white flesh is firmer, with very tiny black seeds; the red fruit is softer, with slightly larger seeds; and though both are sweet, the reds tend to be sweeter – they’re also rarer, and hence more expensive. If you’ve eaten the fruits of prickly-pear cacti, the taste is similar; if you haven’t, imagine a not-so-juicy watermelon. Chilled fruit is great in hot weather, but when temperatures go up, many people figure it’s time to visit someplace that’s air-conditioned. So here’s one that, while popular with tourists, is visited by relatively few people who live here: the Mauna Loa Macadamia Nut factory. Between Hilo and Kea‘au on Hwy 11, follow the signs for Macadamia Drive, and after three miles through papaya and mac-nut orchards, you’ll come to the factory. The last time I was there, the factory itself was not running; harvest and maintenance schedules control its calendar, and you may want to call ahead and ask if you’ll be seeing it run. But there is a self-guided self-guided tour along the outside wall. You peer through big windows at the machinery, and watch instructive videos that explain the processes of sorting, seasoning and packaging in a delightfully humorous way. Finally, there is that air-conditioned visitors’ center [www.maunaloa.com/visitor-center], where a dozen different flavors of nuts are for sale. Besides “dry roasted” and “sea salt,” there are exotic savories like wasabi-teriyaki, and Maui onion and garlic. And for one’s sweet tooth, there are nuts that are “glazed” with Kona coffee, and nuts that are “enrobed” with several kinds of chocolate. You will notice, however, that like wineries and coffee mills, the mac-nut factory does not undercut its retailers; you’ll pay pretty much the same prices here as anywhere else in Hawaii. Puna’s population has grown enormously since the 1960s, when the big subdivisions were created: Hawaiian Paradise Park (HPP), Nanawale Estates, Hawaiian Beaches, Hawaiian Shores, Ainaloa, and Orchidland. The lots were not expensive – some cost as little as a Volkswagen Bug. 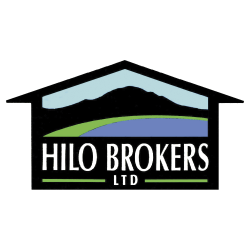 Back then, it was assumed that only retirees, farmers and hippies would want to live so far (20 or more miles) from Hilo. Developers were encouraged, but not required, to install curbs, gutters and sidewalks along their interior roads; but since there was only one paved road in and out of Puna anyway – the two-lane State Highway 130 – it seemed pointless to bring the subdivision streets up to even that modest standard. But after the sugar industry was shuttered, in the 1980s, many people who worked in Hilo started buying the relatively inexpensive lots out in Puna, and commuting along Hwy 130. Traffic increased, and the morning and evening drive-times became so frustratingly congested, that finally, in 2010, the State began a project to widen Hwy 130 between Kea‘au and Pahoa, and to install roundabouts where Pahoa’s main street and the largest subdivision roads feed into the highway. But there have long been calls to upgrade two dirt roads, makai of and roughly parallel to the highway, so they could take some of the traffic load away from the highway. One is Railroad Ave. which, when it had tracks, carried sugarcane trains from Kapoho all the way to Hilo. The other, hugging the coast, and very rugged even for 4WD vehicles, is called Government Beach Road; it originally linked Kapoho with Kaloli Point in HPP. From lack of foresight, however, neither of these roads goes its full length, anymore; they’re in segments, interrupted by overgrown lots, and allowed to become residential, in some places enabling homes to be built within their rights-of-way. And nothing was ever done to improve them. Until now. The lava from Pu‘u O‘o, which in September emerged in the forest-reserve above Pahoa town, is steadily flowing downhill, burning the ohia and waiawi trees and everything else in its path. 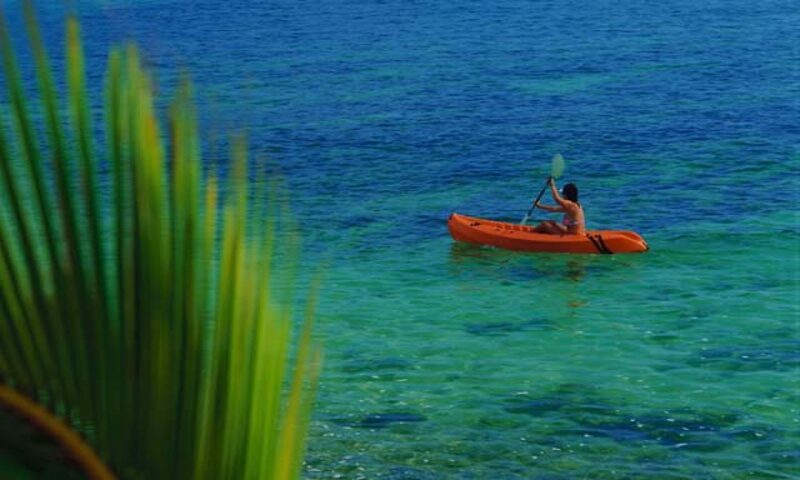 No one knows exactly where it will go, nor when nor if it will stop before reaching the ocean. Whether or not it goes through the streets of Pahoa, it would have to cross Hwy 130 somewhere; and that would force everyone on the Kapoho side of Pahoa to evacuate along Railroad and/or the Beach road. Here is video captured by Mick Kalber, flying with Paradise Helicopters, showing the lava flow burning its way through trees, as it nears the edge of the forest. County and state highway departments are working, right now, punching through undeveloped brushlands to connect their segments, and improve them at least enough to be passable by ordinary cars. Lava would eventually cross those roads too, although by that time, it should be possible to repair and re-open Hwy 130. And there is talk of (once again) repairing the Chain of Craters road. That would enable people in lower Puna to get out by going up through the National Park to Volcano. Here is an official county map of the roads undergoing improvement. Photograph of an official Hawaii County map showing planned roadwork. Much of it is already well underway. Whatever happens, it is important to remember that the Island of Hawaii is alive. We take our friends and family to Halemaumau and gape at the big crater; we walk through the steam-vents; we hike trails that, only a few years ago, were eruption sites. We stop along the jet-black landscape of Kona, leaving bits of white coral as our graffiti, but little thinking what that land must have been like when it was a miles-wide river of red-hot molten rock. Hurricanes form every summer, in the warm waters of the Pacific, but they “hardly ever” come ashore in Hawaii. And as frequent as eruptions have always been, we only rarely get to see their end-game, when lava makes its inexorable way down from summit to sea. And whether we choose to accept this phenomenon of nature as expressing the will of the volcano goddess Pele, or prefer to examine it through the scientific lenses of volcanology and seismology, it is a defining characteristic of life on the Big Island. Those of us who choose to live here are compelled to accept the fact that, whatever we may do to make a home for ourselves on this living island, in the end, Nature will always win. There are three active volcanoes on the Big Island. Hualalai, in the west, rises above North Kona and South Kohala. The flows from its last eruption, in the early 19th century, are what you drive through on the Queen Ka‘ahumanu Highway. Mauna Loa, the biggest volcano on earth, takes up half of the entire island. It erupted briefly in the 1970s and ‘80s, but hasn’t made much of an impact on the island since the 1920s, when its lava burned through an enormous wedge of South Kona, including what’s now called Hawaiian Ocean View Estates. But Kilauea is the most active, having been erupting on-and-off for centuries, and in continuous eruption since 1983. Like its neighbors, Kilauea is a “shield” volcano, meaning that its summit does not come to a (stereotypical) point, like Fuji. Rather, it’s a lengthy ridge called a “rift zone,” along which vents can emerge almost anywhere – and do. In 1960, a previously unknown vent at the far end of Kilauea’s East Rift Zone opened up under the village of Kapoho. In the 1970s, lava from vents within Hawaii Volcanoes National Park closed the Chain of Craters road. A couple of times, the road was repaired, but new flows cut through it again and again, and the effort was discontinued. Kilauea eventually wiped out the park’s heiaus and historic sites along the coast, and flowed beyond the park’s boundaries, where it smothered a couple of subdivisions, two famously photogenic black-sand beaches, the spring-fed Queen’s Bath pond, and much of what had been a thriving, mostly native Hawaiian neighborhood called Kalapana. For the past ten years or so, Kilauea’s most active vent has been under the cinder cone called Pu‘u O‘o. Lava there has tended to pool and puddle close to the vent, making the surface swell, then slowing down and dribbling off in the general direction of the ocean (makai), but stopping far uphill, well short of the coast. He might have added “Hawaii” to that list – meaning the Big Island of Hawaii, which had apparently never experienced a direct hit by a hurricane, at least not since haoles started keeping written records about 200 years ago. But that changed last August, when a hurricane named “Iselle” slammed into the eastern corner of our diamond-shaped island. The south- and east-facing flatlands of the Puna district took the biggest hit. Iselle tore solar panels off roofs, and some roofs off houses; but the felling of trees – one kind of tree in particular – caused the most serious and widespread damage. During the 20th century, Puna was extensively planted with trees to replace ohia and other native species that had been logged off, and to make forests out of fields where sugar cane land had gone fallow. Everyone – developers especially, who were subdividing land into house-lots – believed that people needed trees, both for shade and for giving or restoring a tropical look-and-feel to the place. The tree-of-choice for this enterprise was albezia (Falcataria moluccana), from the islands of Southeast Asia. It seemed ideal. One of the fastest-growing trees in the world, albezia can reach 60 feet in just ten years; it produces a wide-spreading canopy that drops lots of seeds, and thereby extends its range without further human effort. So, when Iselle struck on Thursday August 7, its 60-mph wet winds whipped down acre after acre of albezias. Branches and trunks crashed into on houses, pulled down utility lines, and blocked even the widest roads, isolating pockets of neighborhoods, and cutting off electricity, telephone and cable-TV. Many homes in Puna had catchment-tanks for rainwater, but unless they also had a generator, they had no way to pump that water through their faucets. This was an emergency, the likes of which had not been seen anywhere in the state since hurricane Iniki devastated Kauai in 1992. You can always find something to do on a weekend night on the East side of the Big Island. Rock bands, jazz bands and movies are entertainment staples on Friday and Saturday evenings; some weekends there are stage-plays or theatrical musicals, too; and a few restaurants are destinations in themselves. But suppose it’s Wednesday night. What is there to do in the middle of the week? Where can you go to listen to good music and eat great food? The answer is: at the end of Hwy 137 in Puna (follow the signs to Kalapana). It’s there that you’ll find “Uncle Robert’s” – the nickname for a place, a destination, an experience, really, that’s part local culture, part family outing, part stage show, part farmers’ market, part crafts fair, and all fun. The eponymous uncle is Robert Kali’iho’omalu, whose ancestral compound has been the site of this extravaganza for the past four years. A few dozen vendors set up their food and craft booths in the late afternoon, and the music – under a large, purpose-built wooden shelter – gets under way around 5 o’clock. One of Uncle’s sons (Junior, by name) heads up the “house band,” but on the night you go, you may well hear other musicians too. And don’t be surprised to see some “aunties” get up and dance in front of the stage, just for the love of hula. The music’s almost all Hawaiian – meaning local, and not exclusively in that sweet language. But the food defies categories. The last time I was there, I had beef ribs, baked beans, cole slaw, vegan spring-rolls, Korean-style chicken wings, and dairy-free ice cream made from coconut milk. I skipped the friend wontons, pumpkin curry and everything else because I was just too stuffed. And I didn’t even tempt myself by perusing the crafts, for fear I’d do all my Christmas shopping too early! Also remember: this place is not on the way to anywhere else – it’s a destination in itself, and truly at the end of the road. A few years ago, Madame Pele – that is: lava from Kilauea – closed the highway and smothered a couple of subdivisions. Less than a hundred yards past Uncle Robert’s, there’s no trace any more of Kaimu, a picture-perfect, coconut-fringed black sand beach. And nobody knows when “she” might send more liquid rock down there again. So don’t put off going to Uncle Robert’s any longer. Go next Wednesday! You won’t go hungry at Uncle Robert’s – and you’ll probably wind up buying something handmade, too. Quick – what’s the biggest historic theater on the Big Island? There are several, after all: The Aloha in Kainaliu (built in 1932), with 298 seats? Downtown Hilo’s Palace (from 1925), with 485 seats? Getting warmer. Believe it or not, it’s the 525-seat People’s Theater in Honoka’a. 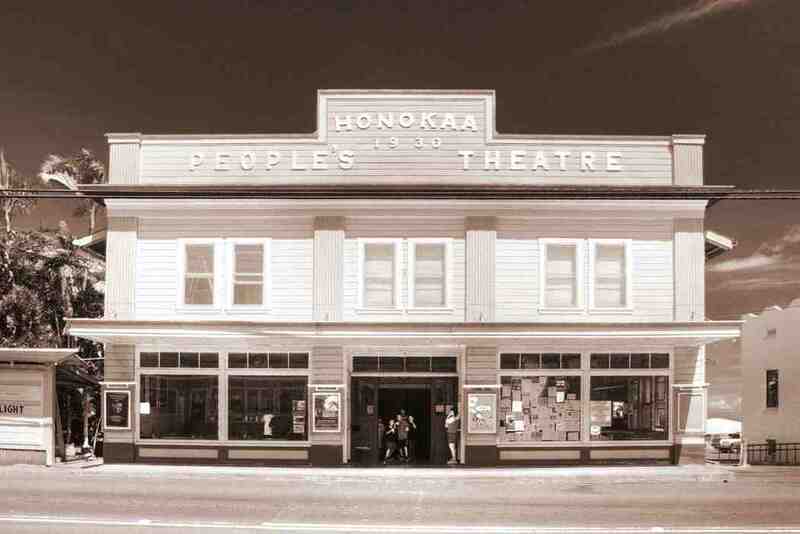 The People’s Theater was built by the Tanimoto family, which owned several other theaters on the Big Island; and like many theaters in that era, one of the owners lived in an apartment upstairs. (The Palace and Aloha had similar apartments, which are now their offices). By 1988, however, the matriarch of the Tanimoto family was too ill to manage the family business, and she sold it to her physician, Dr. Tawn Keeney, who undertook a massive renovation project. Besides making necessary repairs, painting and restoring historic details, he installed a 50-foot movie screen and a modern sound-system, and encouraged producers to bring in musical and dramatic acts. The theater also became the home venue and practice-hall for the national-award-winning Honoka’a High School Jazz Band. The current manager is Dr. Keeny’s daughter Phaethon; and the lobby now boasts a café with locally-made refreshments. It’s on the “circuit” for many touring musicians, such as Maria Muldaur and John Sebastian, who are well-known to the Big Island’s sizable population of baby-boomers. On April 3, for example, the theater will feature bluegrass dobro-guitar virtuoso Jerry Douglas, playing with Hawaiian slack-key guitar giants Ledward Ka’apana and Mike Ka’awa. One-night-only acts like these can command top ticket prices of $40 or more. But regular first-run movie tickets at the People’s are only . . . (wait for it) . . . $6. Visit www.honokaapeople.com for schedules and more info. When the Hawaii County Bandstand got some minor improvements a few months ago, it merely set the stage for a larger project next door. Now the bus terminal has been thoroughly renovated, and there’s more work in the offing to improve Mo’oheau Park on the Hilo bayfront, across from the Farmers’ Market. The bus terminal at Mo’oheau Park has just undergone a thorough renovation. The bus terminal had been showing its age for years, but steadily increasing patronage was overtaxing it. Besides serving many of the County’s Hele On bus routes, it’s a drop-off/pickup point for tour vehicles. The Hilo Information Center is in the middle of the terminal; that’s where the Downtown Improvement Association (DIA) provides bus schedules and informative maps and pamphlets about the Big Island. The terminal also has the only public restrooms in the vicinity, and they were certainly showing their age, too! So improvements were made to the curbs and sidewalks, the roof, the restrooms, the seating areas and the Information Center. The $664,000 upgrade also included mobility enhancements, so the entire facility is now in ADA compliance. The DIA just produced its annual Chinese New Year festival close by, in the park – a festival that had traditionally been held in Kalakaua Park, a few blocks away. But it was moved to Mo’oheau Park this year because, as DIA Executive Director Alice Moon said: “We have more space here! We could accommodate only 21 vendors in Kalakaua Park. This year we had had 35 vendors, and we still have room for more. We also have a DIA office here. And of course, the bus terminal is here, and it has new bathrooms. Forty more stalls in the parking lot at Mo’oheau Park will be added by the end of March. There is open space in Mo’oheau Park, notably the big fields used for soccer and football practice, where a few small fairs are also set up during the course of the year. But Hilo has no shortage of green parkland: the whole bayfront between Ponahawai and Manono Streets, all the way up mauka to the County and State Buildings, was turned into open space after the devastation wrought by the 20th century’s two giant tsunamis. So Mo’oheau Park is not needed as (nor is it intended to be) a green oasis. Rather, it serves as a reminder that some city parks can also be much-needed urban amenities: in this case, a utilitarian bus terminal, a clean fairground, a vintage bandstand and, yes, a big parking lot. “You’ve got a fireplace? In Hawaii?” People might be incredulous, but think about it. Very few houses here have insulation in their walls; none, certainly, have a boiler or any source of heat beyond sunlight through the windows – and those are generally single-pane windows, not the heat-retaining double-glazed kind. But even here, where there is no snow and ice, there is great joy to be found in just sitting around a fire . . . it strikes a chord deep in the human psyche. Jeffrey came to Hilo in 1976 from San Francisco, where he had been a photographer. Here he met and married Sally, who owned a gift shop on Keawe St. “I married a retailer,” he says, “and became one myself.” (By the way, Sally also liked fresh-brewed coffee, but couldn’t find a decent cup near her store; so she started Bear’s, which is still in the coffee business there on Keawe St.) But Sally didn’t give up working when she married Jeffrey. They moved both of their enterprises together, twenty years ago, into the split halves of a single storefront on Kamehameha Ave. in downtown Hilo. Sally’s half is called The Most Irresistible Shop in Hilo. And what is so “irresistible” about it? A variety of merchandise that can realistically claim to offer something for everyone: jewelry, toys, books, shirts, decorative art, hats, souvenirs, lamps, Christmas gifts, tea and saki sets, kitchenware, pareus (sarongs), tee shirts, scarves, postcards, purses, spices, sauces, candies, and locally-made soaps. “She’s got ‘the eye’ for things!” Jeffrey says proudly. … and these two businesses are now for sale! Both adjacent businesses are being sold together. This is a rare opportunity to step into a business venture with a long and positive track record. Jeffrey and Sally have done the hard work building a solid positive reputation for both businesses, and they are also willing to train Buyers during the transition period.